Yesterday, as this was written (11/5/11), I ate Dead Man’s Chili at a funeral, for the first time. I’ve had it many times before. Serving it is a Christmas tradition on my wife’s side of the family, always accompanied with an explanation of the name: It’s the chili traditionally served at funerals. Dead Man’s Chili is seriously good eating. It’s a red chili, made with shredded beef, the chilis used in ristras (the hanging garlands of red chilis sometimes used as wall decorations at Mexican restaurants), and undoubtedly a number of other things I don’t know that contribute to making it delicious. Like all good chilis, it takes a long time to make, and (aside from cooking the meat) begins by making a roux – yes, like gumbo. If you’re thinking chili with beans in it, stop right now. You put this on mashed potatos, or really just about anything, as if it’s a sauce or gravy. What you find by Googling “Dead Man’s Chili” is not the Dead Man’s I know, since those all seem to include jalapenos, and I don’t recall any of those. The one I know is mild, but very flavorful; Googled versions referring to it being hot enough to raise the dead have nothing to do with it. The method for making it is, however, spread rather widely around that side of the family. It must be since, again traditionally, a collection of people all made it independently for the funeral reception, and all their handiwork was served just mixed together. As far as I could tell, nothing of the taste was lost or altered in the mixing. The occasion for serving it was the funeral of Uncle Ben. That’s how he was known by everybody, just "Uncle Ben." Officially he was Benito Martinez, but I only found that out at the funeral. The family members I normally interact with used to think he was “Benjamin.” He was my great-grand-uncle-in-law on my wife’s side. Uncle Ben passed away at the age of 104. Longevity is a feature of that side of the family; many of them make it to 90 or more. (Hope my kids inherited that.) Uncle Ben was the last of his generation, though. I really didn’t know him. I was introduced at a couple of family gatherings over the years as a new relation, but that’s all. I do know, since it was hard to miss, that his trademark was a monster bushy white Zapata-style moustache and a white cowboy hat. He wore that hat constantly, and came by it honestly: He had worked as a cowboy back in the 1920s, on ranches his father owned in southern Colorado. According to an article in the now-defunct Rocky Mountain News published when he turned 99, somewhere there’s a picture of him, in his younger days, on a rearing white horse. Asked the horse’s name, he said it was just a white horse. “Horses don’t have names; names are for people.” He also drank a shot of whisky every day “to keep the juices flowing.” At the funeral, one of his grandchildren spoke of him taking out his teeth and chasing the kids around the house with them. All this adds up to his being a great character right up to the end. 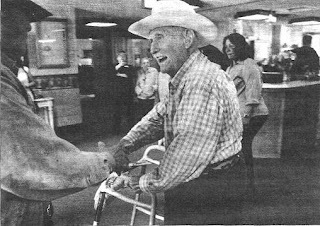 The picture was scanned from an old copy of the Rocky Mountain News article I mentioned. Bad picture.You can barely see his moustache. It was sad to see him in his casket with his moustache shaved off. I don’t know when that was done, or why; we speculated that it was to allow use of some medical breathing thing. He did have his hat with him during the service, though, in his casket. However, at his gravesite, the casket was opened and his sister took his hat. I don’t know how I feel about that. On the one hand, clearly she can remember him by it, and what use is it to him now? On the other hand, well, it was his trademark, always with him. I can’t see him going through the pearly games, or entering the light, or whatever, without his hat on. Presumably, though, if such things are needed he’ll be provided with, say, pants; so why not a hat, too? I really didn’t have a close enough relationship with him to justify an opinion, but heck – he lost his moustache and his hat too? My grandfather-in-law did, though, whisper to me at the graveside that they should have left his hat with him. Farewell, Uncle Ben. We’re eating Dead Man’s in your memory, and after that drinking coffee with condensed milk, not cream (another tradition). And I’ll knock back a shot to keep the juices flowing.